When I first wrote about a World Rare Book Day on the blog only last September (see the post of that title) it was an idea still in the making. The charity tie-in with UNESCO was hoped for but not confirmed. Most of the events not even thought of. I am just absolutely thrilled that it has all come together so successfully. Huge congratulations to all concerned, especially my good friends Norbert Donhofer, Sally Burdon and Barbara van Benthem – you can see the full extent of what they have achieved on the official blog at http://ilabpopupbookfairs.blogspot.co.uk/. I very rarely exhibit at book-fairs – in fact I never thought I would again. The chronic low-level back-pain of a life spent too largely in lugging boxes of books around has exacted its toll. But how can I not be part of this great day? It’s St. George’s Day. It’s Shakespeare’s birthday. It’s even the anniversary of the birth of James Tregaskis, president of the ABA in 1910 (not many people will know this). I can surely get a single bag of books up to town and join in this worldwide salute to colleagues and collectors everywhere. What a day it is going to be. It is all turning out just as imagined, kicking off with a Shakespeare first folio on display in Sydney. An antiquarian book plaza in Tokyo. Events as far afield as Cape Town and Moscow – Zurich, Vienna, Budapest, Milan, Munich, Paris, Antwerp, Copenhagen and elsewhere – books on a barge in Amsterdam, books at Haarlem Central railway station, a pop-up of pop-ups in Sweden, a fair at the Middle Temple Library here in London, and then across the Atlantic to New York, Chicago, Washington, Delaware and Seattle – and ending up, as good booksellers everywhere always do, in the pub. This one in Portland, Oregon. Although we shall only be a dozen or so dealers at the Middle Temple Library (full details at https://worldbookdaylondon.wordpress.com/), the range and diversity will be enormous – from mediaeval to modern and every successive stage of life and letters in between. An instant showcase of everything the rare book trade in this country has to offer – and it’s a book trade in very good shape. I’ll be particularly proud to be exhibiting alongside some of the very best of our really outstanding younger dealers. Traditions of the scholar-bookseller are in the best of hands – and we really do want to reach out to fresh audiences. What to take along? I obviously can’t compete with the stunning Books of Hours from A Venue of Art, but will try to entertain. As you probably know, I deal mainly in first edition literature of roughly the last two hundred years, so I shall be bringing along some typical things from stock – a rare early Tennyson, an uncommon little Dickens which most people won’t know, probably some Trollope and Thomas Hardy, Oscar Wilde – a first edition of The Importance of Being Earnest, and moving on into the twentieth century, some Graham Greene, Evelyn Waugh, a first edition set of Durrell’s Alexandria Quartet, a first edition of The Lion, the Witch and the Wardrobe, a first edition of George Orwell’s Nineteen Eighty-Four, and a few other like things, perhaps some Seamus Heaney and Ted Hughes if there is room in the bag. I’ll also be bringing along a map or two, almost certainly of London. But as the fair is at the Middle Temple, I thought I might develop a suitably criminous theme. 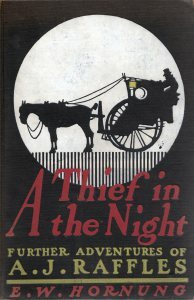 The Dickens is based on a real-life poisoning case, but – although it is by no means the most valuable book I shall be bringing along – my nominated highlight shall be this: A Thief in the Night – the first edition of a 1905 Raffles title from E. W. Hornung. We all love a good mystery and what better than Raffles – that perfect English blend of crime, cricket and high society. This is actually the American edition, which may seem odd – but it is a very, very, much more attractive book than the British equivalent, and of course it has all ten of the wonderful plates by Cyrus Cincinnati Cuneo (1879-1916), only one of which (for some unknown reason) appeared in the London edition. Cuneo of course died in London appallingly young from blood poisoning in those days before antibiotics from a scratch acidentally inflicted at a party in Chelsea. His dancing partner in trying to catch her hair-comb as it fell gave him an accidental scratch to the nostril. This is the edition to have and it’s a wonderfully well-preserved copy – the delicate white enamelling of the full moon against which the hansom cab is silhouetted is usually badly chipped and flaked. I’ve priced it at just £150, although every time I look at it I think it should be more – my great-grandfather used to drive a London hansom-cab after all. I’d recommend buying it very soon before my pencil comes out. That Edwardian period before the Great War was a particularly rich one for crime and detective fiction – it wasn’t all just Sherlock Holmes. 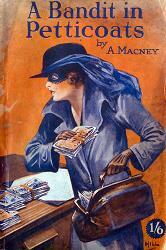 Here’s a 1909 Doctor Thorndyke mystery from Austin Freeman. 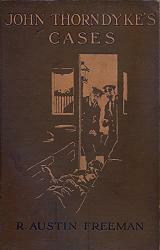 Thorndyke was of course truly the first of the modern scientific detectives – Freeman consciously introduces the book as “a somewhat new departure in this class of literature”. Four of the plates are what he calls ‘micro-photographs’ of the forensic evidence – some fluff from the crime scene blown up for analysis under full-on magnification, specimens of hair follicles, a sample of sand found on the murdered woman’s pillow, etc. It’s one of the great classics of the genre and an attractive copy of the first edition. Priced at £400. I’ll have some other similar things and some much cheaper ones too. Agnes Miller’s The Colfax Book-Plate (1927) at just £25 – the only murder mystery I know in which the whole case hinges on a book-plate (the ex-libris label some owners put in their books). And at £40, William le Queux’s The Broadcast Mystery (1924), which gives us a fascinating glimpse right inside the BBC in the very earliest days of its broadcasting history. I also occasionally dabble in what can only be called pulp fiction. Here’s A Bandit in Petticoats, a quirky pre-war example from about 1930. The evil Rudolph Blotton – the Blot of Park Lane and Throgmorton Street – is overheard scheming at a charity ball by that ‘slender ray of loveliness’, Phyllis Hemley. Complete tosh, but the most enormous fun. But the thing is, it’s also almost certainly the rarest of all the books I shall be bringing along. As far as I can tell there is not a single copy of it in any of the major libraries of the world – and the only copy of it you will find on the internet is this one. I’ve obviously offered it to the British Library – but they turned it down. This may mean that they do have a copy somewhere after all, but that it’s hidden away among the colossal number of books which no-one knows they have (or can ask to see) because they have never been catalogued – either that, or they didn’t want to meet my price of £40, which for an otherwise unrecorded and possibly unique surviving copy of a book can hardly be excessive. Turn up on Thursday and it could be yours. Ten per cent of all my sales on the day will be going to UNESCO literacy projects – so don’t even think about haggling. This entry was posted in ABA, Book Collecting, Book Fairs, Booksellers, Forgotten Authors, Libraries and tagged A Venue of Art, Cyrus Cuneo, E. W. Hornung, Middle Temple Library, R. Austin Freeman, Raffles, UNESCO, World Book Day. Bookmark the permalink.